Artist Andrew Masullo offers his personal insights into the work of Forrest Bess, who has long been one of his inspirations. 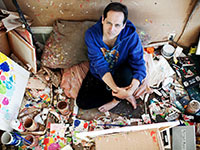 Thirty-four of Masullo's paintings were included in the 2012 Whitney Biennial. This groundbreaking biography by psychoanalyst and author Steven Poser, featuring dozens of Bess's letters and including eight of his acclaimed paintings, explores that narrow line between insanity and creative genius where so many brilliant artists and visionaries have walked. The lecture will take place at 7:00 pm at the Berkeley Art Museum and Pacific Film Archive, George Gund Theater. Featuring San Antonio, regional, and internationally recognized artists, including Forrest Bess. Forrest Bess: Seeing Things Invisible is organized by the Menil Collection, curated by Clare Elliott in collaboration with contemporary artist Robert Gober, expanding on a project he created for the 2012 Whitney Biennial. It will feature a selection of over 40 paintings, along with rare works on paper and selected letters. With a roster of artists at all points in their careers the Biennial provides a look at the current state of contemporary art in America. This is the seventy-sixth in the ongoing series of Biennials and Annuals presented by the Whitney since 1932, two years after the Museum was founded. Christie's is proud to present Forrest Bess, a unique private selling exhibition of the Harry Burkhart Collection of works by Forrest Bess. The show will feature an extraordinary grouping of approximately forty works and will afford a rare and comprehensive view of the artist's oeuvre, one that continues to feel new today, affirming Bess's self-categorization as one who saw beyond his time.